Auxiliary Modules with WordPress Plugins. Each disctricts will follow certain rules for operation provided by Aragon. As built on decentralised blockchain technology the users who invest in these districts will be the owner of the district and have voting rights equivalent to amount on DNT (districtox network tokens) invested. These voting rights are used to come to a consensus regarding changing design, which auxiliary module/function will be added to the district. 1 Where to Buy DNT ? 2 How was the DNT ICO ? 4 What is Disctict0x ? 5.1 What is d0xINFRA ? 5.3 District0x Network Token, DNT Price Chart ? 8 What is DNT- District0x Network Token? 10 What is the use of DNT ? 12 Should I invest in District0x Network Token? Where to Buy DNT ? You can buy DNT from following exchanges as they have good volume. 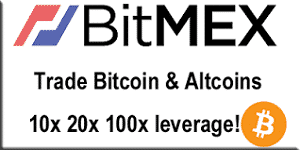 Also Check Our Review For Best Cryptocurrency Exchanges Right now. How was the DNT ICO ? DNT ICO ended on August 1. 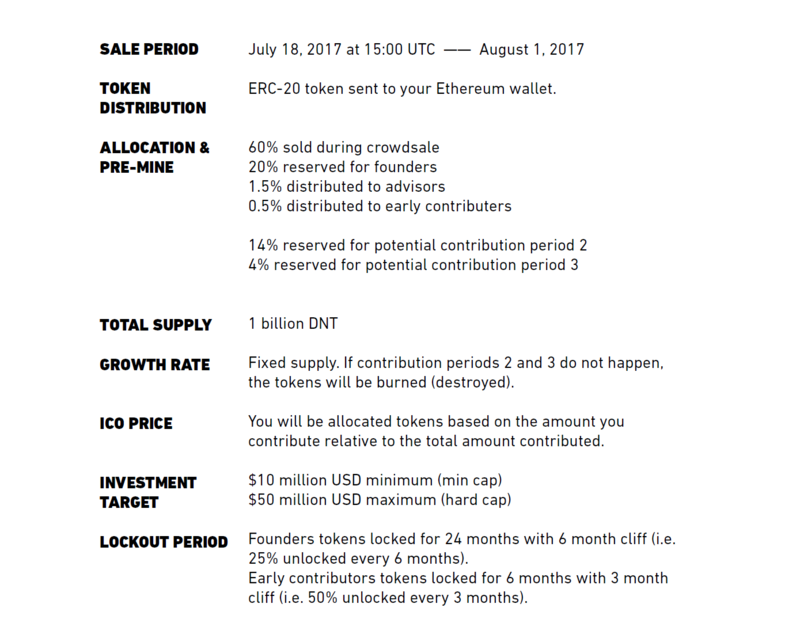 DNT collected $9 million worth ether in crowdsale and failed to reach $10 million USD minimum cap. This blockchain project got support from industry venture firms Boost VC and CoinFund. 600 million District0x Network Tokens (DNT) were distributed to buyers.As per etherscan.io total of 2394 participants contributed 43170 ether to this Blockchain Project. US and Singapore citizens could not participate in ICO due to regulatory issues. Now we all know China and Australia joining the same race, banning/restricting ICO. As per CoinDesk data in July month alone 29 projects have raised around $500 million through ICO’s. At last I can say that DNT ICO was a flop as they failed to reach a minimum cap. District0x is a project which focusses on what applications can Blockchain Technology offer to users. In more simple words District0X will have decentralised sub-projects which are called districts. A decentralized autonomous organization (DAO), sometimes labeled a decentralized autonomous corporation (DAC), is an organization that is run through rules encoded as computer programs called smart contracts. A DAO’s financial transaction record and program rules are maintained on a blockchain.There are several examples of this business model. The precise legal status of this type of business organization is unclear. Districts exist as DAO on the district0x Network. These are the sub projects/ application made on the district0x network. All disctricts will be built upon standard open-source framework, d0xINFRA. If you are in web development then you can relate d0xINFRA with WordPress. 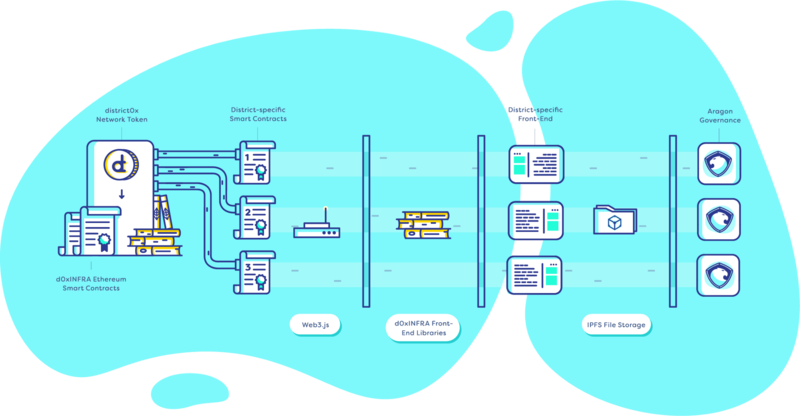 Each disctrict will be based on d0xINFRA framework which contains Ethereum smart contracts and front-end libraries which will enable districts to have basic functions as mentioned above. Auxiliary Modules can be related to plugins in wordpress. Core functions will be provided by d0xINFRA framework but if districts needs specific feature then auxiliary modules comes to the rescue. You can hire a developer from Ethlance to build auxilary module for you as per your need. You will learn about Ethlance shortly. 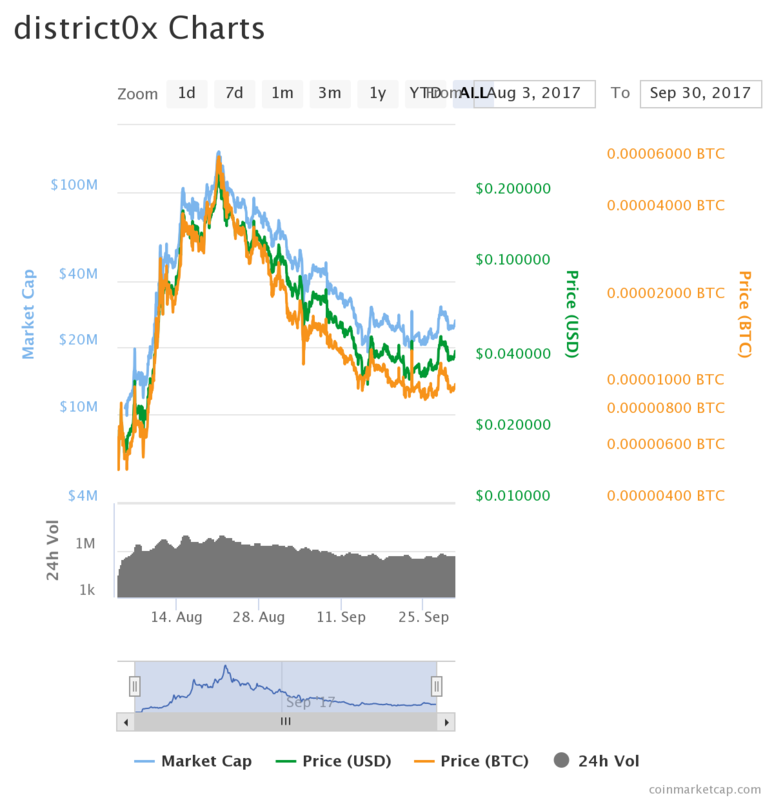 District0x Network Token, DNT Price Chart ? Launched on January 2016, Ethlance is a marketplace where we can buy and sell services much like we do in Fiverr, Upwork, etc. It was the first District launched by the team.Fiverr, Upwork took up to 20% commission from sellers but Ethlance takes absolutely no commission at all i.e 0%. 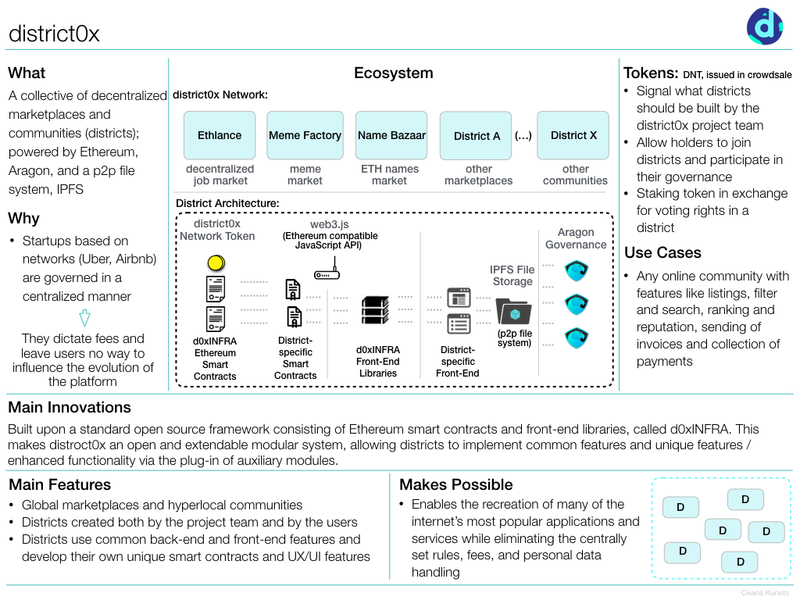 This district is already built and you can check @ ethlance.com. Ethlance uses ethereum for payments. One of the major challenge fo ethlance is to gain user base. They will be competing with Fiverr,Upwork,etc. so they have to spend on marketing and more clean UI. This district will allow users to trade their digital assets on marketplace, much like ebay.com. Users can vote to create new districts which I will explain shortly. All districts will be controlled by the people who invested in the district. Token holders will have the right to vote for any decision regarding their district.To govern voting and decision Aragon will be used. Aragon is an operating system for decentralized autonomous organizations. It provides an easy to use interface for creating, administering, and governing virtual entities. In simple words I can say Aragon is a system for decentralised organisations which allowS them to function well. When new District is created on District0x network then corresponding entity will be created on Aragon network.That Aragon entity comes with predefined set of rules and parameters which can be changed as per need via voting. Tip : Aragon is also a crytpocurrency. Since many projects use them for governance of their decentralized projects, Argon value is bound to increase.So buy some Aragon fellas. What is DNT- District0x Network Token? DNT stands for district0x Network Token.It is a staking token means upon staking token to district, you will get equivalent voting rights.These voting rights are used to make decision for district.In simple words I can say you become a “shareholder” of the district if you stake your DNT in it. If the district in which you stake DNT becomes successful then you would make huge income as district profit is shared among stake holders.Keep an eye on new districts if you think that some new district has a huge potential then don’t forget staking DNT in it. If you have any cool idea for a new district on platform then you can submit a proposal to District0x. For each qualified proposal you will earn Free 250 DNT. All Users will vote for what proposal should the main team build next.If your proposal gets selected for development and proposal is launched as a new district then you will get 500000 DNT. You can submit your vote for a new proposal here. To know more regarding this topic check here. What is the use of DNT ? We all know cryptocurrencies are booming nowadays. All new projects are raising money through distributing coins/tokens to buyers.Some of these coins have real value and can be used for payments etc. and some of these altcoins holds no purpose and thus have no real value. Good news is DNT has a real value which I will explain to you briefly. If you invested DNT in a District then you have voting power similar to stakeholders making decision in a company. DNT is used as a signal for the team that which project/district they should build next. Since the project is new and more DNT used will be added as project progresses. Should I invest in District0x Network Token? 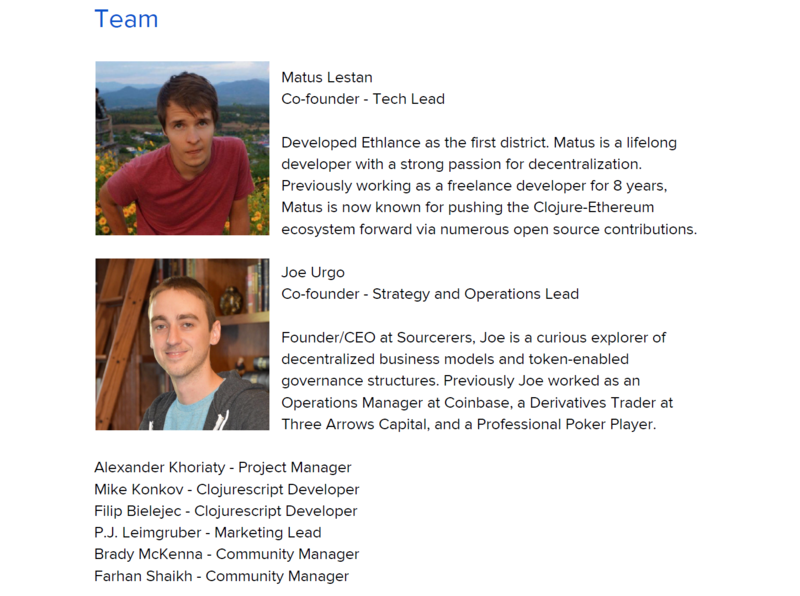 They already have working District, Ethlance since January 2017. Creating District is very easy, no programming knowledge is required much like wordpress for website. More projects/Districts in future means more investors that will increase the DNT price. DNT can become a must go place for creating DAO’s, it has a potential for that. I have invested in DNT and i recommend you all to have DNT, at least 10% of the portfolio. DNT price is now around $0.045, initially after ICO it was $0.02. In BTC price is 0.00001050 which is support level for DNT and a good time for buyin. At present we don’t know how much easy it is to create new Districts. If somehow main team fails to create an easy usable platform/D0XINFRA then it will be very bad for the project. If creating District is not easy then district0x platform will not have many districts, thumbs down. Opposite to above statement if creating new district is very easy then there will be many useless districts and if you stake in those crappy projects then you will lose money. I like the project and can see a long-term potential in it. In long run some districts on platform will succeed and some will eventually fail but it will mitigate the risk compared to other ICO’s where success and failure depends entirely on one project. If we are able to bring more districts to the network which will increase user base eventually it will increase the price. I think the project has a huge potential in long run and you should invest in it. I am not a crypto God,nor a financial advisor. Before investing do your own research. I will love to hear from you all. Do use the comment section below for discussion. If you like my article please give it a share.